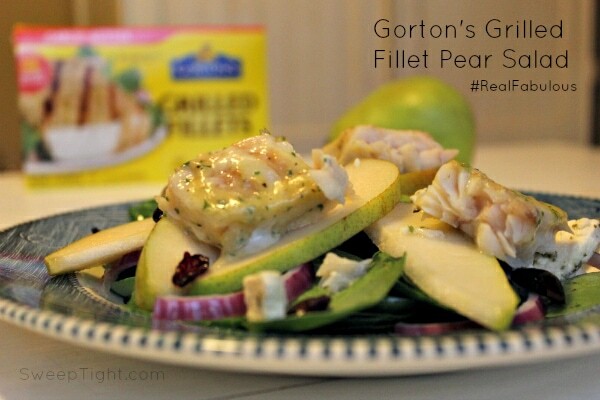 If you are looking for healthy dinner recipes, Gorton’s offers tons of them! I am thrilled to bring you this post sponsored by Gorton’s. I received coupons for free product, but all thoughts and opinions are my own. About once a year I have time to make a truly awesome meal—like from scratch, multiple courses, and all fancy and stuff. When I received a few recipe cards from Gorton’s, I glanced at them and thought ugh, they look more involved than PB&J. I set them aside for a while and went about my day. Since it’s January and I’m all brave and determined with the New Year’s spirit, I grabbed one of the cards and decided to go for it. Well, to my amazement, I created a beautiful fancy meal in 20 minutes. 20 minutes! 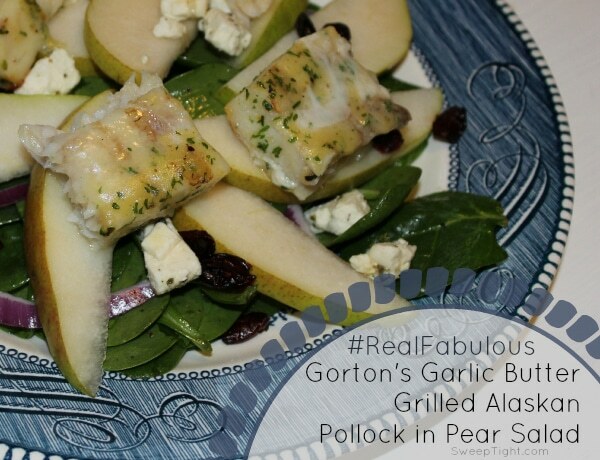 The Gorton’s original Grilled Fillet Pear Salad recipe can be found, along with many others on the Gorton’s website. I made a few tweaks to mine and it was delicious and totally great for my diet plan! This salad only has 274 calories the way I made it! I only had whole allspice so I threw it in my food processor to grind it up—it was super flavorful that way! The final result was a glorious flavor explosion! 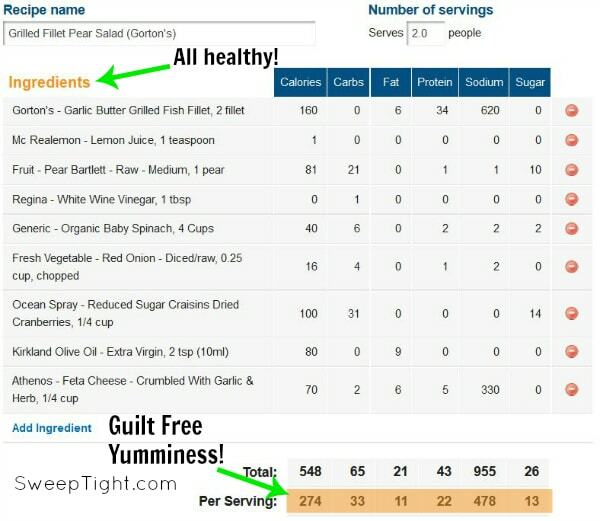 And, with nutrition info like this, I am in shock that it was so delicious! Not only is this yummy and healthy, but it’s really pretty! The next time I have to entertain on short notice, I am definitely busting out this dish! Real Fabulous Sweepstakes and MORE! Make sure you enter for your chance to win a $1,000 makeover grand prize and weekly prizes! Download a coupon to save $1.00 and while you’re there check out all the recipes to get ideas before you go grocery shopping! Find Gorton’s on Facebook and Twitter too! I would love to try the Simply Bake Tilapia. It sound really good. Awesome…put me down fro some of that greatness! Hope this works for an entry…we shall see I guess.